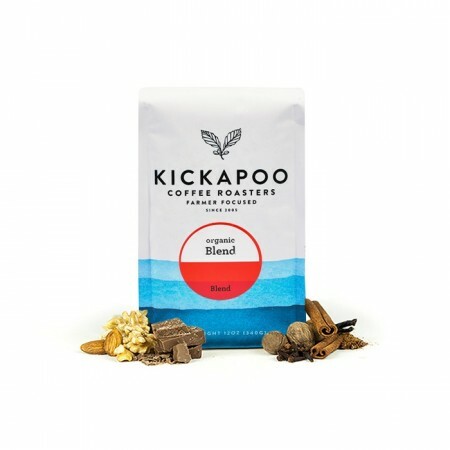 This is the Full Spectrum Organic Blend brought to you by Kickapoo Coffee Roasters. Organic coffees from various producers in Colombia were carefully chosen and blended together. Simple and straightforward, this coffee is intended to work both as a rich blend on drip or as a versatile espresso. This Organic blend has notes of chocolate, butterscotch and a balanced acidity with a lush body. A little thin for my tastes. As an espresso, this coffee had a very smooth and sweet taste. I could taste milk chocolate and a hint of graham cracker. I dosed 19 grams to get the best flavor with a latte. This is was a bit more sour than I prefer. I liked this one but my husband did not. He prefers something a little more mild. Good flavor, not blowing me away but overall a nice robust medium roast that isn't very overpowering. Made it as espresso and in my Chemex, I like it better as espresso but it is still a great cup of coffee from the Chemex. Very nice cup. Brewed in the chemex, I found the butterscotch flavor to be subtle but present. Nice baking spice finish. Like this flavor and body. Not bad. Can we try something nuttier next time? Mild chocolate flavor, with a slight sweetness or hint of caramel. Slight acidity to it, but fairly balanced. I like that the body is not overly heavy. Overall good. Chocolatey and balanced. This one was better than the others, but not the very best. Not a fan- a little on the bland side. Not much body or acid just... bland. Did not make much crema which makes me question the roasting date. Nice aroma, but an average taste. Very drinkable coffee, just not memorable. These are some of the best beans I've ever had!!! Pretty good coffee. No bitterness. Lacks rich flavor, though. As described. Very sweet, very chocolatey and a strong caramel after taste. No sourness whatsoever. Served as a flat white. My grind was a bit more fine and 18g with a bottomless portafilter. I'm on day 9, and it might be at peak. Hope it stays this good for the next week. I was in love with the smell of this one, but the taste didn't come through as I had hoped. Easy to dial in and consistent. This was my favorite so far. The coffee has a good aroma but it seemed to have too much acidity for our taste. I really like this one. Seems like a great one to start with! It's not too dark and bitter, pretty mellow and overall yummy. Sorry that's not a lot to go on. Has a decent taste. Much better than my last order. Pleasant chocolate taste, not much for caramel or butterscotch - but has a decent flavor. I prefer a more earthy taste. Very pleasant aromas, look forward to my coffee each morning. This was a great start. Really nice body, I would call it "crowdpleasing." No complaints, happy to taste others that are a little more adventurous in one direction or another. Best coffee I've ever made at home, thank you! too sweet and mild for my taste-- when I first entered information about my coffee taste I did not put down in the check box to have a sweet coffee and yet this what was sent to me -- why? It was not a bad coffee I simply didn't taste a deep flavor or complex composition. It felt like a one note coffee that didn't get richer with each sip or subsequent cups. It was smooth and fell nicely between light and dark, but its lack of a distinguishing feature or complex notes meant I wasn't as excited to brew it as my previous coffee. The lab members all liked the coffee. It smells delicious as beans and brews nicely despite the varied brew strengths that are appreciated by the group. Way too bland and weak. Excellent! I enjoyed this one much more than the first coffee. Seems to be much more flavorful. Slightly acidic, but I did not mind. Not bitter at all. Very good bean color. I would like more coffee with beans of this color. My favorite so far. Great shot of espresso or a rich, sweet, cup of press. Strong acidity which balanced the sweetness. I liked this coffee a lot. So sweet - didn't need anything extra! Slightly light and metallic tasting. This coffee was too light for my liking. I am very used to drinking dark roast coffee- it is pretty much all I drink- so it's possible my taste buds are a bit too sensitized for this blend. It smelled wonderful- definitely like chocolate and caramel, but I did not find it to be rich. This coffee is not too acidic, which is fantastic. Good flavor, not something I'd normally pick with the fruit notes in description but good! I enjoyed this coffee for sure, even though I'm not into chocolate flavors. I was pleasantly surprise! I do wish to try something a little more floral and not so earthy. Overall though, I would totally buy this coffee again.